Elementals are the living manifestations of an element created by the energies that radiate from a Realm's latent magic. Although some may hold a physical form, elementals as a species are so volatile they are unable to hold such a form for long. Breeding and Reproduction Elementals are created when the extreme magical energies of a particular element coalesce and create a sentient, living being. As such, it takes them time and energy to create and maintain a truly physical form. Many elementals will stay in a more ethereal form for many, many years after their birth, save for elementals that are naturally solid (such as those with nature or earth affinities). All newborn elementals will spend a period of time dormant until they awaken with a new soul. Two elementals of any gender may rarely beget offspring if they are of the same element, and are powerful enough to spare the energy lost in the process. In this method of reproduction, both parents temporarily fuse into one being, then release portions of their combined essences into a newborn elemental, who will awaken after a period of dormancy. Unless they have enough energy, the parent elementals will die in the attempt, drained of too much energy to survive. The dormant child must have been given enough energy to survive long enough to awaken, and must have been given a soul by Linath or her shepherds. Otherwise, the energy within it will simply fade away into nothing. However, due to the enormous amount of energy needed to maintain a truly physical form, procreating with more substantial species is known to be incredibly difficult. If, by chance, a female elemental is able to hold its form for long enough, then there is a very small chance that a half-elemental hybrid will be born. Males have much less hardship, and sire more hybrids than their female counterparts can bear, though these hybrids tend to be significantly weaker in elemental affinity. Traditional elementals rendering offspring in this way is very rare regardless of gender, and only aura elementals are known to produce hybrids with any guarantee that they will carry the child full term or sire a powerful baby. Elemental Life Though the First Elemental and the first few traditional elementals were created by a god, subsequent elementals do not share the same process of divine birth. Instead, they are either created by a Realm's energy itself, or through the fusion of two elementals who share the same affinity. Scholars long wondered how and why these newborn elementals gain life through such unconventional creation, and it is only recently that they've discovered why. It is well known that spirits, once their ties to the memory of the living are severed, will eventually fade until they are little more than a conglomerate of power and spiritual essence. These Faded Spirits are governed by spiritbeasts who dedicate their lives to keeping watch over the powerful, but mindless creatures - and also these who give new purpose to them when the time is right. With Linath's blessing, the spirit shepherds may guide a Faded Soul to the Soulforge and purify it, and then send it down to be placed in the waiting vessel of a newborn elemental. Lost Elementals Legends tell of nearly extinct and reclusive types of elementals that are said to exist in great number only in a place called Zinlaea, which is rumored to exist in the distant north of Felnova. These lost elementals are more powerful and refined, known to be able to hold physical forms more easily and for longer periods of time than their cousins. They are also known to personify three specific combinations of elements or magic; other combinations of opposing forces are impossible. Lost storm elementals represent the water, wind, and lightning of a Realm. Chaos elementals are the fire, water, air, and earth, chaotically coexisting within a single form. Aura, by far the most powerful of the three rare subspecies, is crafted from the reiatsu of a Realm itself and given personification. Details of all three may be found in the subspecies section of this page. Species info credited to Blazeh/Verridith, JPG, Thistle, and Skyeh. Appearance Elementals are the living manifestations of the elements themselves, given life by a Realm's latent energies. They are composed entirely of the element they represent and are split into eight different and unique variants. These taken forms are generally tenuous in their solidarity, and regularly dissolve when an elemental feels threatened. An elemental's true form is a floating mass of their element, and their taken form is anything they forge themselves into otherwise. Fully physical forms are utilized by powerful elementals who may contain their element within a solid body without harming themselves or others. When in their taken forms, they can be of any shape, mainly driven by the elemental's personality. No two elementals will appear exactly the same; for example, two fire elementals who have chosen the shape of an identically-built dragon may differ in heat intensity, flame color, and fire appearance. Fire: Typically of a volatile nature, flame elementals find it difficult to create a truly physical form. They burn with such intense heat that flammable items nearby are often set aflame as they pass. When they do manage a physical form, whatever it is seems perpetually to be burning up, and ashes constantly follow in their wake. Occasionally, there will be elementals who appear more as beings of magma than flames. Only the oldest, or most gifted, fire elementals may adopt fully physical forms that will not set fire to whatever they touch. Water: Water elementals find forms easier to maintain, though choosing one is a particular difficulty. Usually, they are completely made up of a liquid that can range from a clear, countryside stream to the grimy muck found in local swamps. Regularly, water elementals will leave trails of water behind them as they travel unless their control over a taken form is especially strong. Air: These elementals are a flighty bunch, and though they can create their forms easier than some of the others, it is very difficult to see at all. The way to spot an air elemental is to look for distortions in the appearance of objects behind them, or to look for something responding to a localized breeze. Some of the stronger elementals are able to catch and hold clouds or dust within their forms to help others see them, though these continuously move and shift, leading some with weak stomachs to avoid looking at them entirely. Very rarely may an air elemental hold a fully visible, or physical, appearance. Earth: Earth elementals have the easiest time creating both taken and physical forms, and often have the most diverse appearances. While some may consist of stone, earth, or sediment in a living shape, others may appear to be moving groups of plants, trees, and other flora. Combinations of these are also possible; such as stones covered in plantlife, or plants with certain features constructed of stone. Rarely, earth elementals may consist of metal ore, though they naturally bear nothing resembling forged pieces when they do. Lightning: These elementals have a very difficult time attempting to create taken or physical forms. Without them, they are simply energy and plasma, with very little hinting that they may be sentient beings. Even those few who manage the feat have difficulty maintaining a taken form, giving it a crackling quality whose edges constantly shift from their proper places. As they walk, small jolts of energy discharge into nearby conductors, and living things regularly become dazed if they come in contact with one of these elementals. Ice: Ice elementals are exactly that: beings of crystallized water given life. Some will appear almost pure blue, while other seem white and nearer to snow. Some of the older elementals may even make their form of pure ice, trapping bubbles of air or hairline cracks in their physical form. Where they walk, a thin film of frost covers all surfaces, quickly melting away in warmer climates. In this case, adopting a physical form means controlling their temperature to where they may not freeze whatever they touch without intent. Dark: These elementals are composed of pure shadows and dark energy. Some seem to roll and roil together like stormclouds while others appear two-dimensional and flat. In stronger specimens, light tends to bend toward these elementals, making their features even more difficult to see. These elementals can take both taken and physical forms in dark places, but will often revert to their natural state in bright light unless particularly strong. Light: These elementals are anywhere from a soft glow to a blinding blaze of light, their forms only distinguishable by the dimmer rays coming off of it. More powerful individuals seem to eliminate shadows around them completely, making them appear either two dimensional, or simply a silhouette of light. These elementals can take both taken and physical forms in bright places, but will often revert to their natural state in lightless darkness unless particularly strong. Culture Elementals are naturally drawn to one another. Like attracts like, and communities of similar elementals form small community groups. This was as far as they would mingle, though, as each elemental group despised its natural opposite. Wars are prevented by an age-old faith in the mythical land of Zinlaea; the belief that a ruling class of lost elementals exist to end such battles as soon as they begin. While the validity of this belief has been called into question by non-elementals, elemental faith remains true, and they will bow to the authority of any lost ones they come across. Fire: A community of fire elementals is usually found on "burning grounds" - lands already so hot that they are unable to harm anything by setting it aflame. This is often in volcanic regions and underground caverns, though may briefly show up in the remnants of wildfires as well. They value strength and power, often competing to see who can make the tallest column of flames in both social and special occasions. Outsiders may see the community as brash and aggressive without knowing better. Water: These communities are very laid back. They like to go with the flow, often taking turns between ecstatic action and long breaks of relaxation as the mood hits them. They value adaptability and regularly change sides in a conflict based on the moment. Outsiders can and do see these communities as lazy and chaotic; sometimes, they're more right than they realize. Air: Air communities may be either quite difficult to spot, or catastrophic to the weather patterns of the area. They're known to be one of the most active types of elementals when gathered together, and groups of them rarely seem to sleep. Games and competitions are constantly being held, and no job is left unfinished for long, because someone will come by and pick up the slack soon. Neutrality is valued highly among these elementals, though they can and will prove deadly enemies. Outsiders often see them as aloof communities without knowing the full investment these groups hold in other happenings. Earth: An earth community is stubborn by nature. They value tradition and regularly keep records of seemingly mundane things because "that's the way we've always done it". From the outside, these communities may appear less stubborn to new ideas, but just because they keep track of it does not mean it will get implemented. Lightning: These communities are the most impulsive and least likely to settle until something important is blasted to bits by an overload of energy. They prefer action over inaction and sometimes collide with each other in the process of getting places, resulting in massive discharges to the nearest conductive surface. Usually judged to be idiots and inconsiderate, most outsiders are unaware of the intricate decision-making that happens within a split section. If they truly acted without thought at all, there would be much more destruction than there is around their communities. Ice: These communities are known to be cautious, often taking twice the amount of time considered descent before making a final decision. Tactical observations and the ability to perceive an issue in its entirety are valued highly in these communities. Outsiders might think them slow and inefficient, and though they are slow, the decisions made by these communities often lead to the greatest possible efficiency and success of any of the options available at any given moment. Dark: Mostly active at night, these communities are disturbingly silent. The elementals may move about and complete tasks, but few conversations are started, and no small talk is exchanged over tea. Dark communities have been accused of secrecy and evil intent in the past, but the truth is that they really value modesty and independence. Members of a community do not speak of inappropriate topics, and the neighbors frankly do not need to know about every thought that crosses one mind. If it is important, they will converse with another, either to solidify or build and idea. This has led to an unfortunate number of more malicious beings apparently hailing from these communities, it is only because the others do not think it appropriate to control the course another being wishes to take. Light: These communities are the most welcoming to visit, and often members will approach visitors and engage in conversations without warning. They value transparency and truth, and they've done their best to be allies with the dark communities, believing in the balance that is created when the two work together. From outside, light communities appear overly trusting and too talkative, but they are formidable enough to hold their own if they need to. Abilities Elementals are, in an essential way, pure magic given life. They are made of the element they control, and though the degree of control is determined on an individual basis, it is well known that to be able to use the full degree of an elemental's power results in the mutually assured destruction of both the elemental and the target. The oldest elementals can maintain taken and physical forms of practically any kind with enough practice, though they are never very physically strong. Fire: Fire elementals utilize their flames for a variety of purposes; everything from casting balls of fire at their enemies to summoning flames to burn are common. Much rarer is the ability to control pure heat or magma within volcanoes. In desperation, a fire elemental may unleash their full potential in an enormous explosion, the beginnings of an incredible forest fire, or even the eruption of a nearby volcano. Usually, the elemental either becomes part of the attack or sputters out as its energy is drained. Very few survive such displays of power. Water: Commonly, these elementals can use available water and bend it to their will. This includes but is not limited to rivers, bodes of water, rain, humidity, and their physical forms. Some are able to control mist or fogs, but very few are able to control the blood of living beings. Older elementals may generate water, such as rain, for their use. Final acts of desperation have included tsunami waves, hurricanes, and severe, sudden floods. This often results in the elemental losing its form and being absorbed back into the natural water cycle, though a select rare few have been known to survive. Air: In an air elemental's repertoire, wind gusts are the easiest to control, and they can range from huge gales meant to push over the target to sharp zephyrs meant to tear through defenses. It is also possible to summon large tornadoes, though this ends up being a last-ditch effort for all but the most powerful of air elementals. Some rare elementals are able to control sound and soundwaves in anything from focused, concussive blasts to far-reaching echoes used for long-distance communication. Usually, air communities will have at least one of their number who may control sound, and often contact other groups in this way. Earth: Elementals of earth utilize available material around them whether it is dirt, gravel, mud, sand, plants, trees, or other related things. They are an excellent defensive element, and are the most resilient of their kind, though those that appear to be made of flora are significantly less. Some earth elementals have used their full potential to create giant sinkholes, collapse mountains, or cause an entire forest to explosively grow. Often, these elementals either turn into statues, join with local plantlife, or dissolve into dust once they've done this final, desperate act. Lightning: Lightning elementals utilize electricity as their base ability; anything from lightning bolts to static shocks are possible. Some are able to go on the offensive with their taken forms at breakneck speed, and their attacks become almost completely invisible. Desperate lightning elementals go out by causing the largest lightning storm or single bolt an area has ever seen, vaporizing a large area, or similar feats of destruction. Few survive such acts of destruction. Ice: Many ice elementals may utilize their abilities for anything from thrown spikes of ice to entire walls meant to deflect enemy attacks. They are also known to be able to manipulate pure cold sometimes, and others may be able to manipulate the weather and cast small-scale snowstorms at will. Accounts of enormous blizzards and entire cities encased in ice have been noted from ice elementals in last-ditch efforts, rendering extreme destruction. These elementals find it difficult to live in warmer climes, and too much heat can kill them easily. Dark: It is usual for dark elementals to use shadows as their powers develop, though some have been able to master black fire or poisonous fumes. More powerful members are able to use a pure, suffocating blackness and the ability to corrupt perfectly normal and healthy objects. These elementals go out with the intensity of a solar eclipse, often killing off large portions of flora, fauna, and population in a single, final act of desperation. Afterwards, they simply melt into the shadows and disappear forever. Light: Summoning light in darker places is commonplace for these elementals, as is sudden flash bombs and white fire. There have also been cases where light elementals can use healing and purification energies as well. The full potential of a light elemental is extreme, and sometimes lovely. It is rumored the first aurora was created by one, and another gave their life to heal an entire city of plague. One can really only see the remains of a light elemental when they go out in a dark place, namely the drifting light that seems to live in a place for years until it dims out of existence. Extreme, prolonged darkness may sap a light elemental's energy, and eventually kill them. After the One fell, Death’s first victim, the Ten fled and hid themselves. Leartes burned with righteous anger as he went out into the wilderness. He roared his rage to the heavens, and shed tears for what was lost and could never be reclaimed. But as his rage subsided, he gazed upon his surroundings, and was inspired to create. He took air and earth, fire and water, lightning and ice, and formed them together, a perfect blending of disparate elements. The elements coalesced into one, but lacked form, and substance until Leartes coaxed it to life. The first elemental marveled at its formless shape and raw power, and reveled in its control over the natural elements. To thee I give the steadfast earth, the flowing water, the swirling air, the rapid lightning, the furious fire, and calm ice. To thee I give the ability to become as a solid shape, or an ethereal form. To thee I give the power to destroy, and to create. To thee I give a life of perfect balance, Leartes intoned. 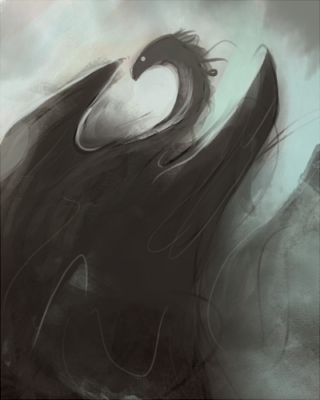 Filled with purpose, the first elemental took the form of a dragon formed of the elements, and went out into the Realm. As time passed, Leartes created other elementals, most comprised of but a single element. But to a few, he gave extra attention. For some, he took of the air, water, and lightning, and made of them living embodiments of fierce thunderstorms. For others, he took equal parts earth and air, fire and water, and formed chaos elementals. With a select few, he took of his own aura, and made the aura elementals, beings of great power, comprised of pure reiatsu. Over time, the elementals spread over the Living Realms, migrating as they were drawn to fitting dwelling places, each according to their elements. The first elemental eventually found a secluded forest, and settled into a deep slumber in the very heart of the woodland, though many remain unaware of its presence. Name: Erosae'en Uyhest. Location: sleeps within an ancient grove in the Rynorel forest. Status: Alive. 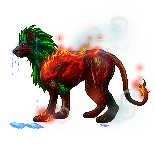 The elemental Ancient First's form shifts constantly, but usually somewhat resembles some form of wild animal, composed of all elements in their purest states. Solid earth, liquid water, hard ice, raging fire, swirling air, shining light, concealing darkness, and crackling lightning, all in equal measure. For many millennia, far longer than Felnova and Kurai have existed, this elemental has existed in a semi-conscious state, diffusing into the very ground, almost completely becoming one with the very grove it inhabits, causing the grove to shift according to its whims. While it tolerates the presence of the local elves since they don't interfere with the forest's growth, it is less welcoming of other races. The grove might be either impossible to find, or react violently to intrusion. As a being composed of all elements, the elemental is extremely skilled in their use, far beyond others of its kind, and many other races as well. Lacking any permanent body, it communicates entirely via mind-speech, although none now live who have ever communicated with it. Classification: very rare elementals composed of spiritual energy alone. Location: abroad. Strongest of all elementals. These rare elementals are comprised entirely of energy, and can take any form they will. Their eyes, however, always betray what they are - they constantly swirl with their own powerful aura. Capable of devastating reiatsu attacks. Lost elementals are a limited store species; please do not make one unless bought. Thank you! Classification: very rare elementals composed of fire, water, wind, and earth. Location: abroad. An elemental comprised of fire, water, air and earth. Often are formed of all of these elements, and cannot hold a single physical form for very long. Thus, they often appear to be various species, rarely humanoid. Very old Chaos elementals are able to solidify their form much more easily. Classification: nature elemental; tree spirit. Location: primarily Xaeri and Millirand. The dryad is a tree spirit found in the forests of Xaeri and Millirand, very rarely abroad. Though males of this species seem to be all but non-existent, they are known to breed with earth- and nature-based elementals, elves and humans with the resulting offspring showing none of its lesser heritage. They appear as women with silvery green skin, covered in moss and bark. Their hair is formed of vines, leaves or flowers, and their hands are tipped with sharp wooden claws. Classically, they will also have a pair of short wooden horns that twist from their heads, as well as very lon, pointed ears. Their eyes are almost always white. They have an incredible control over plantlife, and can meld with the wood of nearby trees for protection. It's said that when a dryad dies, their spirit becomes a seed, and from that seed a great oak will grow. Classification: fire-elemental fairy. Location: abroad, but rare. The fire sprite is a small, delicate fairy consisting entirely of flame. Though some have wings and some do not, all are able to fly; they seem as flickering sparks in the air, fallen stars, and are sometimes mistaken as lunar butterflies for their fancy of leading travelers astray at night. Upon closer examination, they have slender bodies that resemble molten metal with a bright jewel-heart, usually naked but for their cloaking of flame. They are impish and cunning, and enjoy tormenting those unfortunate enough to trespass into their small territories. Florids are intelligent plants that eventually take on a humanoid form, their appearances as diverse as there are varied types of flora. They spend the first century as non-sentient plant-life before entering a stage called "bloom," in which they suddenly become sapient and start developing a full sized humanoid body over the course of a year. Most florids are short, have green skin of varying shades, and their flower generally can be found on top of their head (though other places have been reported). Larger flowers and plants render taller florids, and their anatomy is greatly influenced by what type of plant they take after. They thrive on sunlight and water; without these, they may survive on nectar, sap, or sugar for a time. If deprived of nutrients for long enough, a florid's flower will begin to absorb its body, shrinking in size until only the flower is left, upon which time they may re-root to the ground until able to create a body once more. Otherwise, florids are gifted with nature-based magics usually centered around what type of flower they have, as well as the ability to manipulate plantlife and summon vines around them. Most florids do not stay with their children until they bloom, and rarely stay with each other at all, resulting in an inability to create any sort of culture to pass on to one another. Few florids can even talk, and the ones who do pick up the languages from others. Classification: artificially-crafted elemental. Location: artificial earth elemental. Location: abroad. The golem is an artificial creature created by gnomes upon the discovery of Soulgem creation. By fusing a Soulgem within a construct of any hard material - usually stone, wood, or metal - a golem gains the ability to move and act in accordance to its creator's will. Oftentimes, these compressed souls are taken from criminals and locked away in a golem, made to serve at some task or other until the Gem is either drained of essence, or shattered from stress. Most Soulgems don't retain their awareness of spirit for more than a few months, before the personality and thoughts of the original host fade away completely. Golems are often crafted with earth magic into vague, rough humanoid shapes, though they can be crafted by hand into more artistic renditions with a great amount of time. Rarely, a Soulgem can be fused into an animalistic shape - though the strength of the Soulgem cannot hold large beasts for very long without breaking, unless the soul within is exceptionally strong. The Soulgems are usually located at the very heart of the golem's chest, so that they cannot be easily destroyed. When powered by a Gem, their eyes will glow with whatever color the spirit's reiatsu was in life. Classification: very rare elementals composed of lightning, wind, and water. Location: abroad. An elemental comprised of water, wind and lightning. 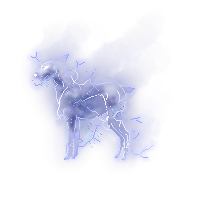 Though less chaotic in form-changing than the Chaos, a Storm elemental is less able to hold a physical form for very long than a normal elemental. Most will choose humanoid forms, though some are more partial to the bestial. Classification: air-elemental spirit. Location: abroad, but rare. Like the fire sprite, the sylph most resembles a fairy, though they have corporeal bodies; somewhat larger than their fiery cousins, these creatures are completely translucent, their internal organs invisible. Their wings are large and comprised of condensed wind and mist, and a current of air surrounds them constantly. They hold a disdain for humans that goes beyond the petty ways of their brethren, and they actively seek to drive away any intruders far from where they make their homes. Sometimes, they will even lead a hapless traveler to their death over a cliff, into quicksand, or into deep water. Classification: elemental-infused tortoise. Location: almost exclusively Lizzarkyth. The great titantoise are gigantic, ancient tortoises joined with the spirit of an earth elemental at birth. Growing to titanic proportions, these creatures appear to be mountainous tortoises with great forests growing upon their rocky shells; others may have mountains and craggy rocks, and still more may appear to have a shell encased completely in solid crystal. Very rarely, there may be one born with a metallic shell that attracts iron ore - over time, this thins and shines into a solid metal surface polished like to that of a mirror. Though the young look like an average tortoise, if a little larger, they can be easily spotted by unique, brightly-colored and iridescent eyes. Sometimes, titantoise will have a large set of forward-facing horns. Some aquatic variants of the titantoise have been noted in the oceans of various Realms; much more like sea turtles than tortoises, these are called simply 'titanturtles', and appear as floating islands that move amid the sea. Classification: water-elemental women. Location: anywhere near calm water sources; ponds, lakes, creeks and slow rivers. Nymphai are said to have once been a race of human females, ones who fell in love with their own reflection, and who were cursed by Balion to forever be beholden to the water that they looked into. Though the curse has long since faded, water nymphs live on, beautiful females who cannot leave the water's touch. As their are no males, much like the dryad, they lure men into the waters of their homes, spinning a spell on anyone unfortunate enough to drink there. From here, they can control the thoughts and emotions of the one they've snared, able to force them to do anything from procreation to fetching things from inland they may want but cannot have. When it rains, only then may a nymph travel abroad - unlike their cousins, the siren, who can move about free as they will. Classification: dangerous elemental formed of Void energy. Location: rarely abroad. Very, very rare creatures who are not only formed of the energy of the Void, but appear to hold several of the Void hydra's own abilities within their chaotic forms. They are incredibly rare and cannot reproduce, created in the confines of the Void hydras themselves. They appear in the Living Realms only when a Realm is about to die - however, once they are able to manifest outside of the Void through a world's imbalance, they may freely traverse the Realms, and may pose a danger to anything and everything within them. 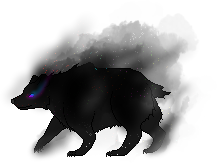 Void elementals may appear in any shape that they wish, from animalistic to humanoid, and always are consisted of black energy that devours light, save for minute specks like minuscule stars. Sometimes, these stars are brighter than others, and may appear in multiple colors; their forms are insubstantial, and can never be fully physical. All Void elementals have eyes that shift and change in hue, and glow with a brightness that cannot be quenched. Their energy may be seen radiating from them like smoke, burning like black fire, or bleeding from them like water. The space around them appears distorted, twisted, as if they are not supposed to exist. All Void elementals - once having escaped the Void into the Living Realms - are able to pass from one Realm to another without the use of portals or Markers. They are masters of dark magical energy, and are impervious to the dark element and any physical attack. Certain elements (light, fire, and lightning), pure energy and reiatsu assaults can be deadly to them, and may eradicate them completely or send them back to the Void, breaking their connection with the physical world. Enchanted weapons may also harm them, but unenchanted things have no effect. Many Void elementals do not have stable personalities. They are unpredictable, chaotic, and uncontrollable; they often inspire fear where they go, and are regarded as terrible omens of death, seen most often when a Realm is on the brink. Void elementals are a limited store species; please do not make one unless bought. Thank you!